I’ve got a brandy-new scope, a Celestron NexStar 8 SE… so of course it has been raining or overcast every night since I bought it last week. The good news is that I got the scope-to-Starry Night interface working, so once the scope is aligned I can use Starry Night to slew it. I’m really excited about the tracking features on this scope – should make both observing and photography much easier. Took this from our balcony in Phoenix last week. You can see the moon, Jupiter (top left), Venus and Mercury (bottom right), and Earth. That’s a personal best for most heavenly bodies in one shot! Click the image for full-size version at flickr. 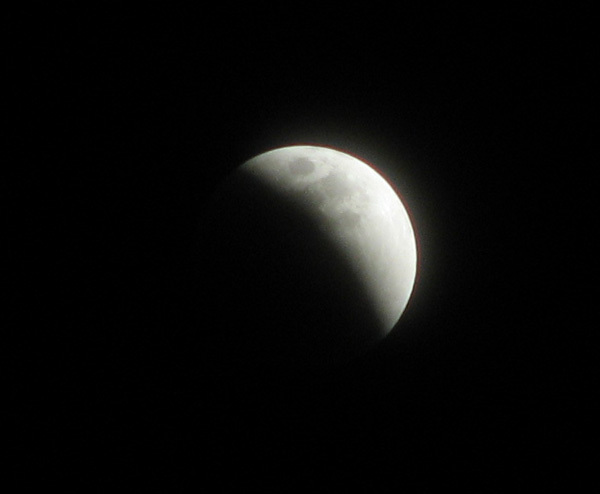 Here’s a couple pictures I took during last week’s total lunar eclipse. I’m not a real photographer so I sort of didn’t know what I was doing with my camera settings. There’s no filters on any of these, just varying exposure times. Here’s one very near totality. 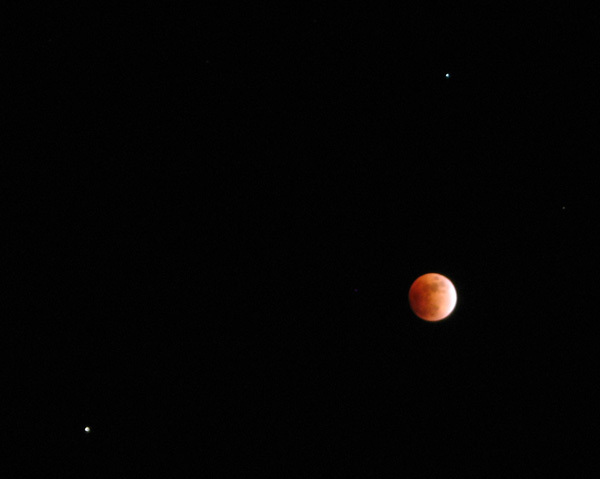 You can also see Saturn (bottom left) and Regulus (above the moon). I kept running in and out of the house. I was too cold to keep taking pictures all the way through. 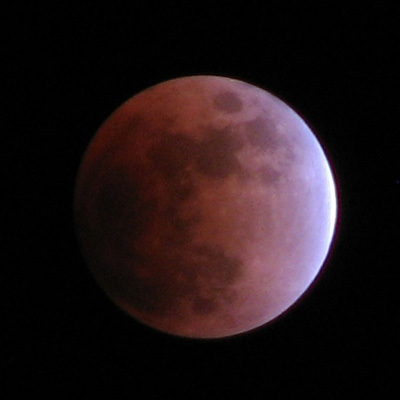 Here’s the last one I did before zooming out for the moon & saturn pic above. 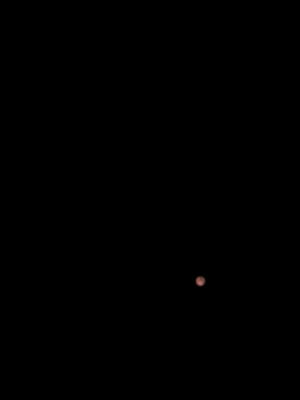 Mars is on its closest approach for the next 9 years, so I checked it out a few nights ago. They aren’t kidding when they call it the most disappointing object in amateur astronomy. I hoped that computer enhancement would help out a bit, but not much. As always, gear was an Orion XT8i scope and NexImage camera. This is not natural color, it was shot through a red filter. You can make out some of Syrtis Major and maaaybe some south polar ice cap but that’s about it. Oh well. Still, I can cross Mars off my list. Here are two more moon pictures taken during a very brief moment last week when it was both clear and not too cold. Each picture is actually a composite of 2 photos, which themselves were made by averaging several hundred frames of video. Some time I’d like to do a composite of the enitre moon. I wonder how many images that would require. 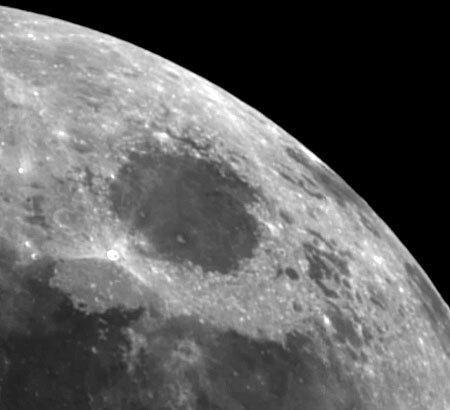 The first one shows Mare Crisium on the moon’s eastern limb. 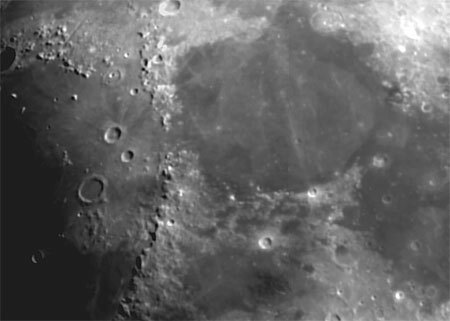 The second is centered on Mare Serenitas, which is more toward the north-east-center of the moon. If you want to put these features in context and see much more detailed pictures (or perhaps find out the names of those Mister-Bill looking craters), check out the Full Moon Atlas. Next Wednesday afternoon, Mercury is going to cross in front of the sun. If you’ve got a scope, get yourself a solar filter and check it out! If not (or if it’s cloudy), you can watch it on the SOHO website. I’ve got a filter for my XT8i on the way, and I hope to be able to get a picture of this. I’ve been participating in the Stardust@Home project. It’s in the same spirit as the SETI@Home project, except you’re actually doing something instead of just donating computer cycles. The Stardust spacecraft flew near comet Wild2 in January 2004. Returning to Earth in 2006, it brought back particle samples from the comet’s coma. The Stardust@Home project has scanned the aerogel collector from the spacecraft. Volunteers go online and (after taking online tutorials and passing a test) examine a tiny area at a time searching for interstellar dust particles. If you believe you’ve found something you mark that slide. In and of itself, not a very exciting activity, but it’s pretty cool to have a chance to be a part of space science from your own home. Or office – I’ve been examining samples at lunch. I can hold a turkey burger in one hand and work the “virtual microscope” with the other. The project keeps track of your statistics, as well as throwing in the occasional “calibration” slide to keep you on your toes and measure your effectiveness. I’ve identified only 2 possible dust particles so far. Other volunteers view the same slides for confirmation and then it moves on to the scientists. Haven’t heard any verifiction yet. It supposedly takes a while. 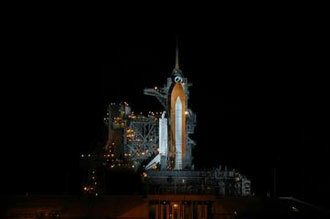 The shuttle Atlantis will (hopefully) launch this morning around 11:41 AM EST. The schedule for this mission, STS115, has been moved around a lot but it’s finally getting off the ground. NASAÃ¢â‚¬â„¢s ready to get back to building the International Space Station, which means the shuttle program is coming up on some of the most challenging space missions ever. And it all starts with the launch of Atlantis on STS-115 in August. Atlantis’ six crew members will install a second set of solar arrays on the space station, doubling the stationÃ¢â‚¬â„¢s ability to generate power from sunlight and adding 17.5 tons to its mass. ItÃ¢â‚¬â„¢s a mission theyÃ¢â‚¬â„¢ve had four years to train for, and itÃ¢â‚¬â„¢s still no cakewalk. Update: the mission has been postponed until Saturday at 11:14 due to a problem with a fuel system sensor. The Planetary Society has a brief article by a member of the IAU Nomenclature Committee about the naming process for planets, planetary features and so on. We maintain a database of potential names for planetary features, which must all fit within a theme for that body. For example, eruptive centers on Io are named after mythological deities that are related to fire, Sun, or thunder (Loki, for example, is a Norse blacksmith as well as the trickster god).